Packaging is in 40-lb. multi-wall paper bags with poly liner; Full pallets are 56 x 40-lb. bags. 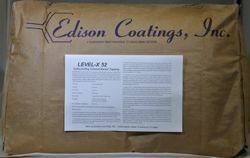 LEVEL-X 52 is a one part, cement-based, polymer modified floor topping and leveling compound designed to provide smooth and level interior or exterior floors and decks with a minimum of time and labor. LEVEL-X 52 can be used to prepare a wide variety of sub-floors for installation of tile, carpet, resilient flooring, wood flooring and many types of surface coatings. It may also be left exposed as a final finish in light industrial or commercial environments. LEVEL-X 52 also provides rapid, economical casting, repair and leveling in exterior exposures and in wet environments. It readily accepts a variety of finishes, or may be left exposed to traffic and weather. Full pallets are the most economical way to buy and ship LEVEL-X52. Edison Coatings, Inc. products are manufactured in the United States of America from US and foreign components.